"Which is better for a construction site, mesh banners or traditional banners with wind slits? " This question comes often as construction companies contact us about banners for their work sites. Some cities and municipalities require fence coverings at construction sites. If yours requires fence banners, or you are looking to make the most of the opportunity this article can help you determine the right answer for your banners. What is a wind slit? A wind slit is a slit cut into the banner with the intent of giving the wind a way to blow through the banner and reduce the stress on the banner. With out the wind slits, a banner would act as a large sail catching the wind. If there are no areas for the wind to pass through, the structure supporting the banner may blow ever and cause damage or even injury to anyone in the fall area. Usually the cut is made in the shape of a half circle or half-moon. this creates a flap that can open and let air pass through depending on the air pressure on the banner. Mesh banner is a vinyl banner material with a weave that leaves a percentage of the area exposed for wind to pass through. Like traditional vinyl banners, it can be printed with vibrant high resolution graphics. The image on right right shows the surface of mesh banner before it is printed on the left, and after if it is printed on the right. What are the trade offs between the two? There are advantages and disadvantages to each options. Below is a summary to help you determine the best option for your project. For most uses, the mesh banner is a strong winner for durability, appearance and safety when the banner will be hung outdoors in an open area or against a open chain link type fence. We work with builder across the country to create crisp, vibrant banners that get their message out into the community and keep the workplace safe. If you are on the fence (pun intended :-) about which way to go with your fence banners, give us a call. We are happy to point you to examples and help you weight the trade off's between the two options. See RainMaker Signs' Portfolio for more construction signage, construction fence banners and banners. You are also going to want to check out this article with tips about how to make your fence mesh banners look great. We believe great visual communications make great things happen. 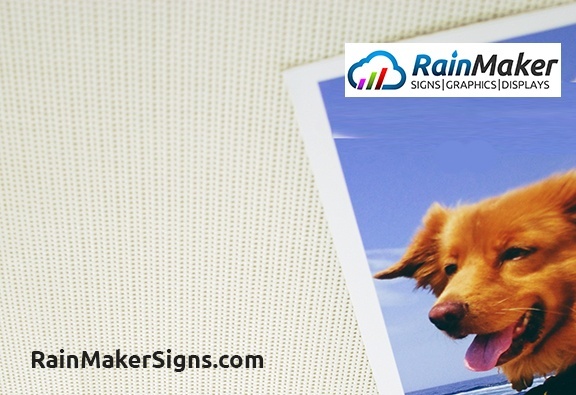 Give us a call at 425-861-7446 , email us at answers@rainmakersigns.com or click below to request a quote. We'd love to hear from you!